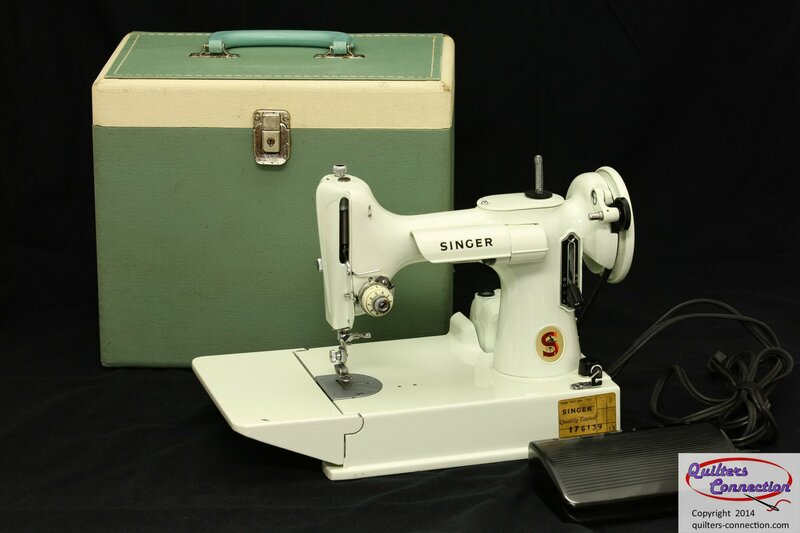 Singer discontinued Featherweight production in the US in 1957. Near the end of production in the remaining plant in the UK, Singer introduced the white 221K7 Featherweights. After searching for some of these machines for years we finally came across several and are pleased to offer them in our shop! This gorgeous machine is a 1966 model in exceptional collectable condition. As a 9+ condition this is one of the finest and least-used white FWs we have ever had. The "mint" or "pale celery" green cast is prominent and beautiful.It has one small nick in the paint on the bed extension, which has been touched up since the photos were taken. It has the later "lubed for life" motor, and the clamshell style foot controller, which many feel is much easier to use than the earlier Singer button style. It even has the original Singer inspector's sticker. It has the original Singer case in excellent condition. Included with the machine are the original Singer bobbin case and 5 bobbins. These machines are the lightest of the Featherweight series. Paired with our Quilters Connection FW soft case you would have an ultralight kit to take to classes, retreats, or sit and sews. This Featherweight that has been serviced and is ready to sew.